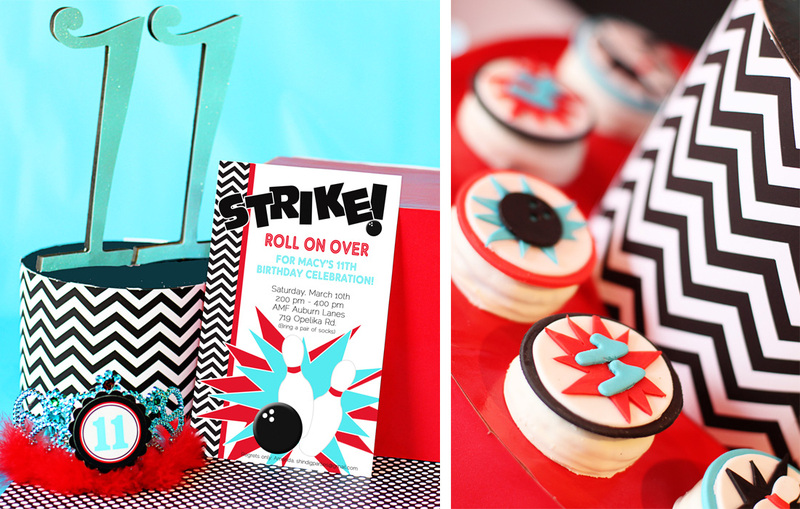 I'm so excited to share the photos from my daughter's bowling party a few weekends ago. Sometimes being the owner of a party business means your own children’s birthdays can sneak up on you. And this year, a week before my middle child’s birthday we realized we had no plans — Oh no! We decided a last minute bowling party was the way to go. Acting quickly to pull it all together involved an almost all-nighter of designing a set of bowling party printables and luckily, we sent out invitations the very next day. 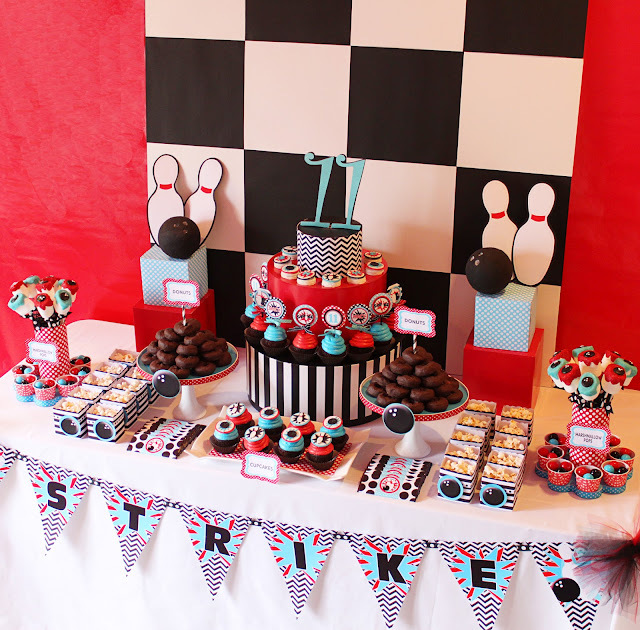 The centerpiece was created from paper mache boxes covered in paper patterns to coordinate with the BOWLING PARTY COLLECTION. The base in bold black and white stripes was a fun find from Hobby Lobby. The red center box was covered in red wrapping paper from Walmart and the top box was covered in the printable black chevron paper from the printables collection. 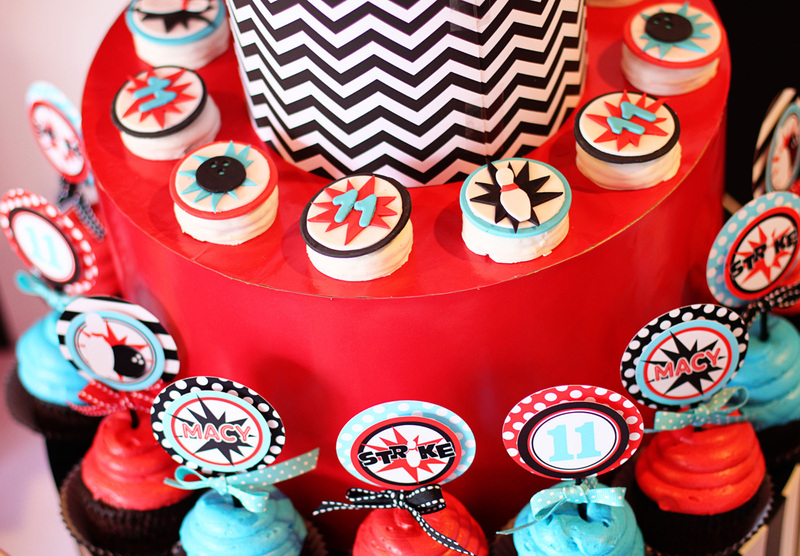 The “11” on the top was created from wood numbers covered in turquoise glitter cardstock. 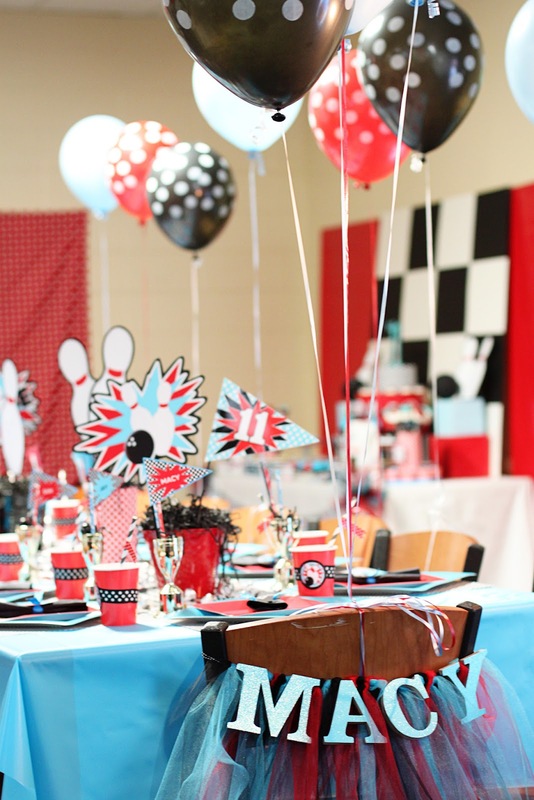 On either side of the centerpiece, tiered boxes held a fun bowling topper created from the printable bowling pins from the collection and a styrofoam ball covered in decoupaged black napkins to resemble a bowling ball. 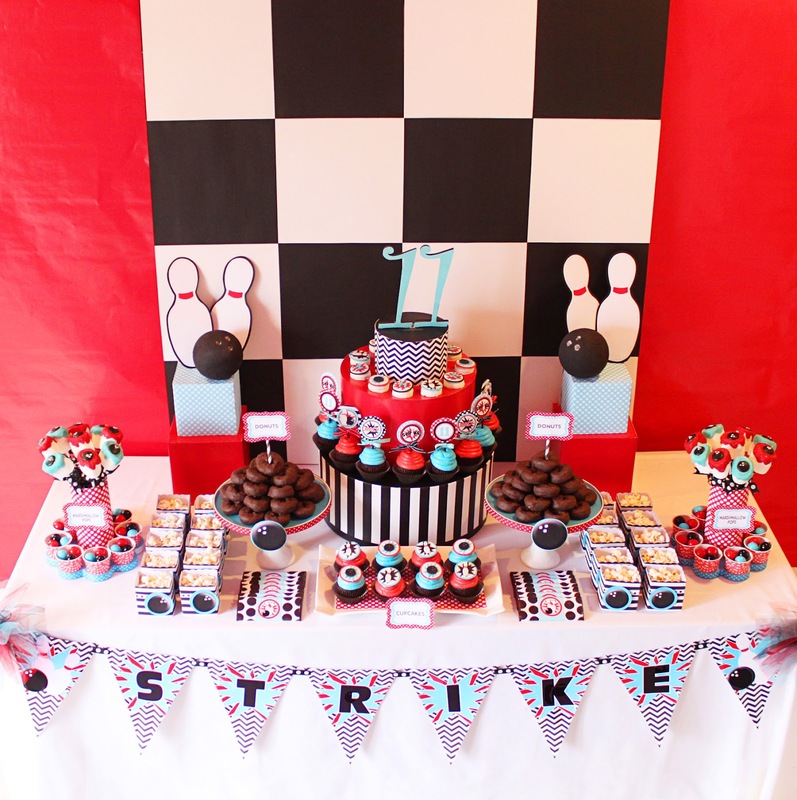 A simple backdrop made from a 4’x4’ piece of ¼” plywood covered in alternating pieces of black and white 12”x12” scrapbook paper was a striking complement to the rest of the dessert table decor. 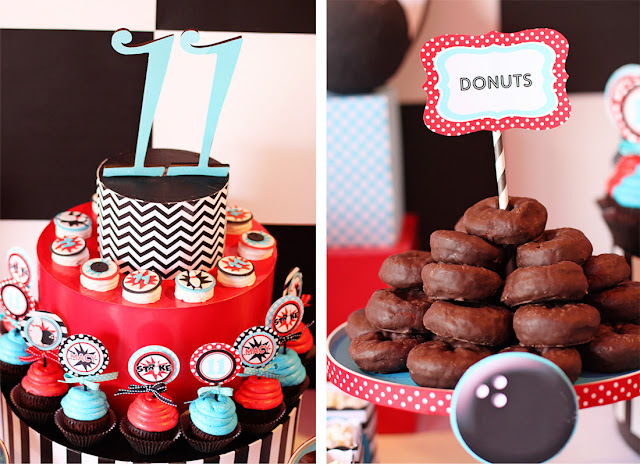 Another fun element of the table included plates of store-bought chocolate covered doughnuts placed on DIY cake stands made from thrift store candle holders and lazy susan tops. 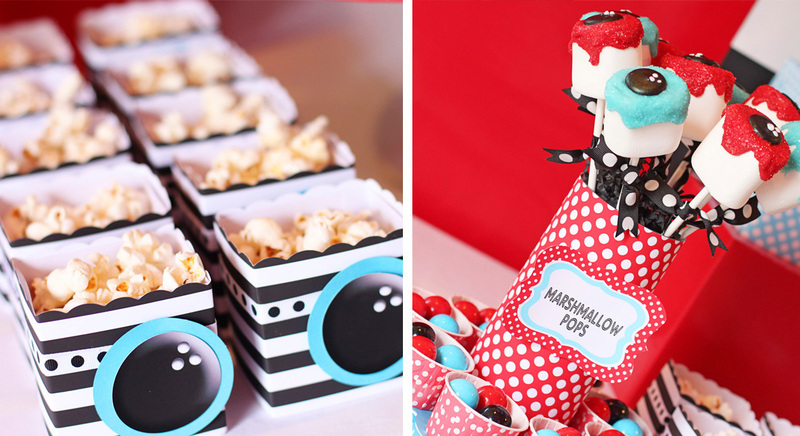 I love these cake stands and use them all the time for different parties. I can glue on different ribbons and trims and completely change the look from party to party. 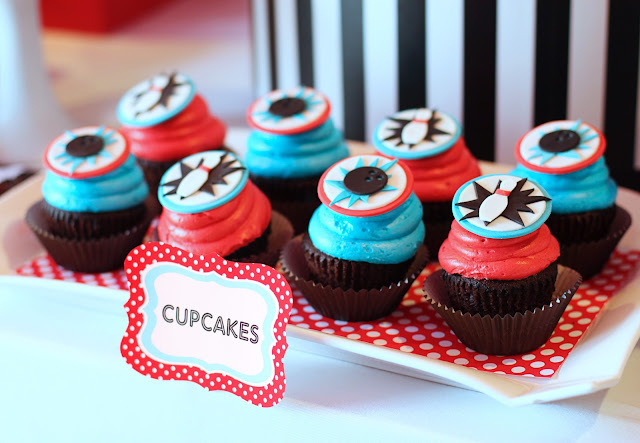 To save time, the cupcakes and cookies were store-bought and embellished with printable cupcake toppers and gorgeous fondant toppers from the talented Brittany of Edible Details. Since I was in a time-crunch the marshmallow pops were the only food I made myself. In only about an hour, I covered the tops of over-sized marshmallows with turquoise and red chocolate candy melts sprinkled in colored sugars. 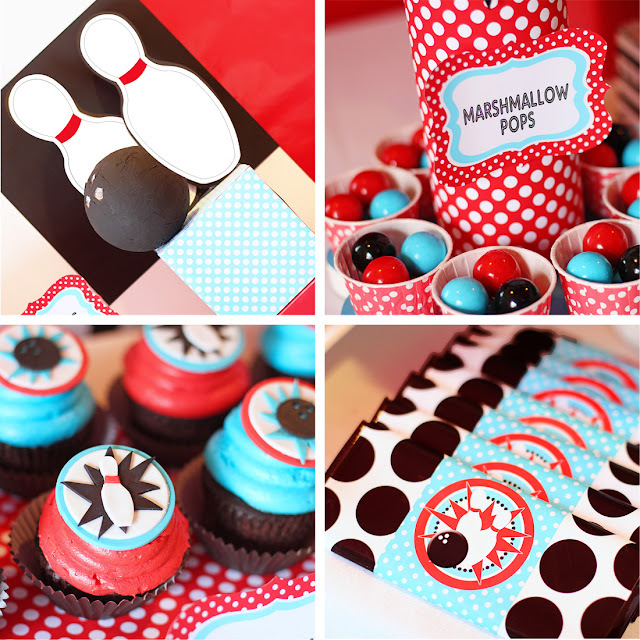 A fun little “bowling ball” made from a chocolate candy melt with three white dots topped off the treats. Placing the marshmallow pops in Dollar Tree glass vases covered in a red/white dot printable paper made a simple display. 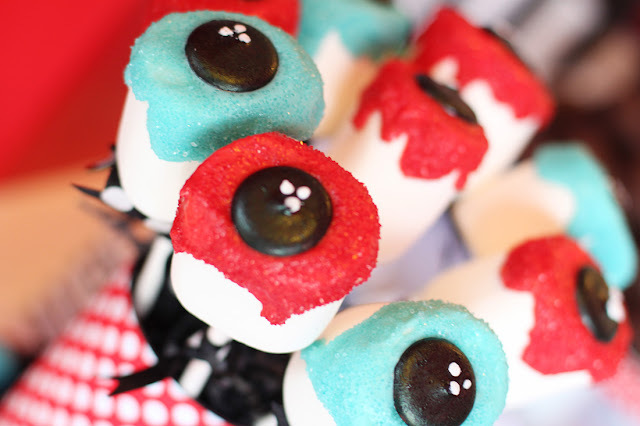 Surrounding them with cups of gumballs added a touch of color and another sweet kid favorite. Other items on the dessert table included candy bars wrapped in the party printable design and Dollar Tree favor boxes covered in a printable black and white stripe paper to hold popcorn for the guests. 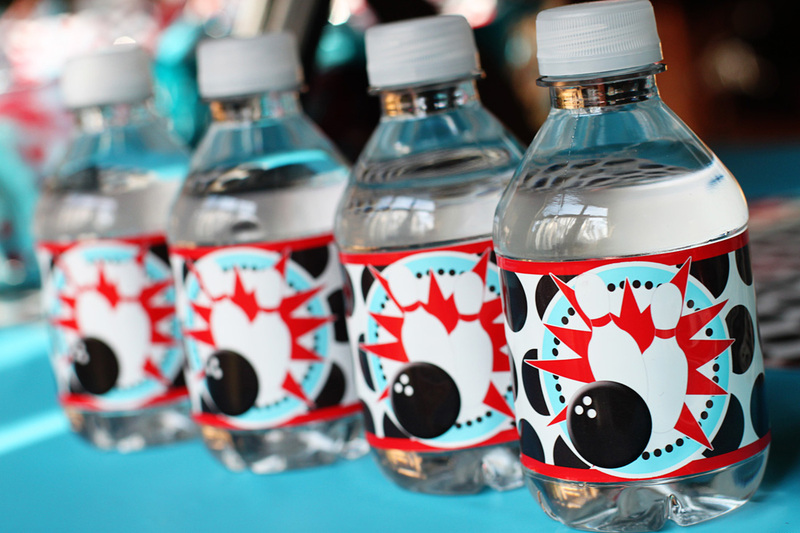 A printable bowling ball design was added to the front of each snack box to tie in the theme. 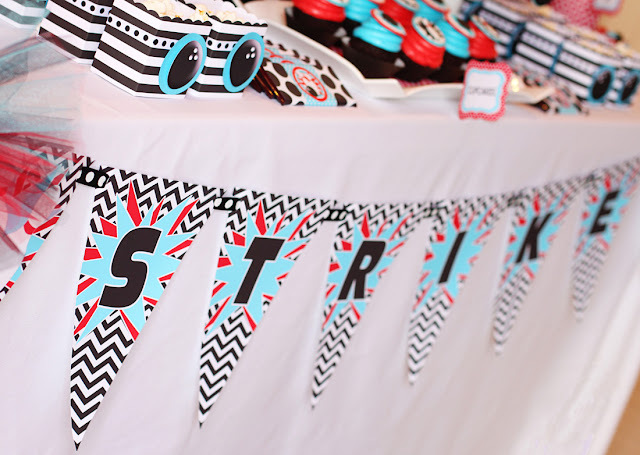 Stay tuned for tomorrow's post on the place settings and table centerpieces as well as a fun idea for a STRIKING Photo Booth! Yes, I've even got more photos! I would love a tutorial for the cake stands you made!! The party is AMAZING!!! Thanks Susan, but it wasn't hard at all. Just a round plastic (lazy susan) I found at a thrift store and some ceramic candle sticks at the thrift store, too. Then I spray painted everything white and glued the round top piece to the candlestick base with hot glue. Then I just use ribbon around the edge of the top circle and that's all. Easy! 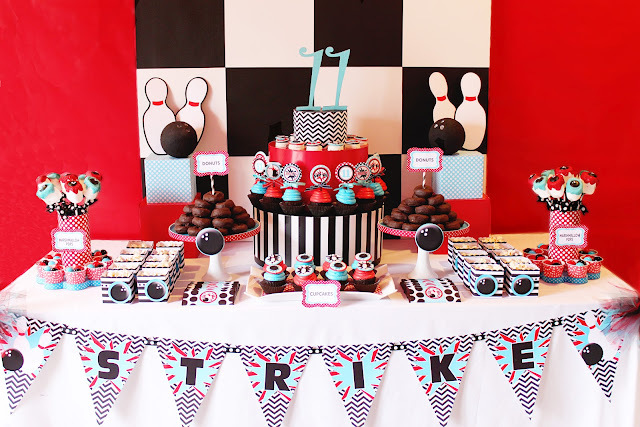 I absolutely love this bowling party!! What I love is that it looks fabulous but you didn't spend a ton of money on treats and favors and everything else. Most of it is store bought and DIY - that's so much more realistic for most people. Thanks so much for sharing all of your little tips & tricks!! I love your party! Would you come over to Cast Party Wednesday and share your cute ideas with us? Thanks, I hope to see you there! So glad I found your site. I'm following now. I love hosting parties, and I know I'll find a lot of inspiration here. That is adorable! 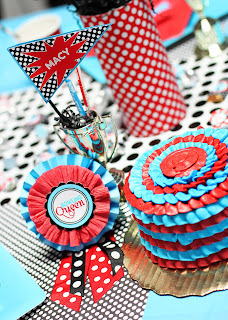 I would love for you to share it (and any other creations) at my new linky party "Pin it and Win it Wednesday" at www.cheapcraftymama.com!